Hakusan, Japan, April 14, 2016 – EIZO Corporation (TSE:6737) today announced that every touch panel monitor in its current lineup (15 models) now supports Windows 10. The latest drivers are now available to download from EIZO’s global website. Offering swift support for new updates to an operating system ensures reliable continued use of EIZO’s products. 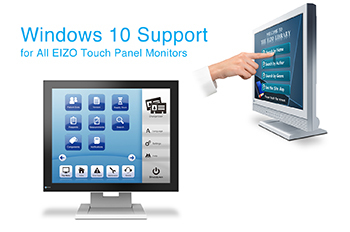 Users who have already upgraded to Windows 10 or plan to in the future, can rest assured that they can make a smooth transition with their EIZO touch panel monitor. EIZO’s lineup of touch panel monitors offer a wide range of sizes and touch technologies for meeting the specific requirements in markets such as medical, industrial, and business enterprise. To learn more about the solutions available, visit this page.